Introductory Video supplied by Innovative Interfaces Inc.
Search the library catalogue and place holds on the go! Use the virtual Library Card right on your App. 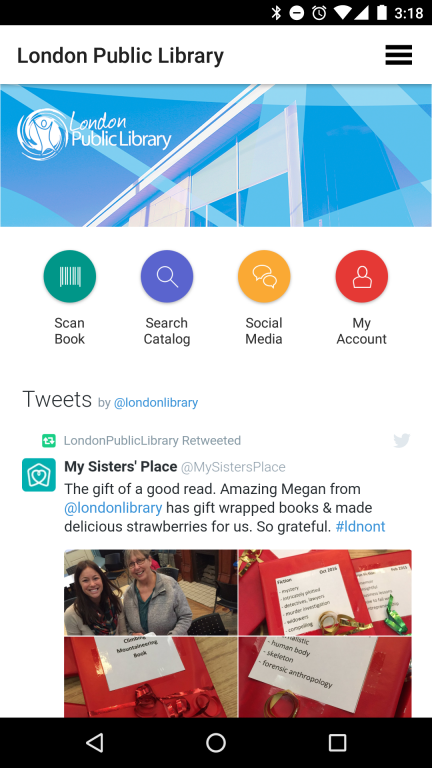 Go to the My Account "Profile" section and select 'show card' and your library card barcode appears and can be scanned in self check or by a staff member in place of using your physical library card. At a book store? Scan a publisher's ISBN barcode. Find available items in our catalogue and place a hold request right then and there! MyLibrary! is currently available from the App Store for iPhones and other iDevices iOS 8 or greater and for Android devices (4.1 and up) on Google Play. You will need a PIN# (a 4 digit number) assigned to your library account. Staff at any Library location can assist you with this.